For the month of March, I decided to focus on a sort of pantry challenge. For me, this was less about trying to only eat from the pantry and more about trying to motivate myself to use some of those things that have been hiding out in there for quite a while. We have a deep freeze, and I had definitely lost track of what all was in there. During March, I worked on using things from the freezer and making a point to cook with pantry ingredients that aren't necessarily my "go to" items. That meant the only meat I bought for the month was about 2 pounds of ground beef because it was marked down, and it had been forever since I bought any because of the lack of good sales. 1. Polenta and risotto aren't all that difficult or intimidating once you bite the bullet and find a recipe. These were tucked away in our pantry, and I had just never cooked either because it seems like I'm always reverting to my trusted sides. 2. We go through a decent amount of fresh produce, and that's ok. I didn't cut back too much on buying produce except to really think about whether I had a use planned for it and it was really necessary. I think we probably have been a bit wasteful in the past with produce. 3. I really need to keep a better inventory of what's in our freezers. I found things in the deep freeze that I definitely didn't know was in there. 4. I need to do a better job of cleaning out our freezers. Same as above for our kitchen freezer. I threw out so many random, gross popcicles. Eeeew! 5. I think I can keep it up for at least another month. We did a really good job of whittling down what's in the deep freeze, but there is plenty left in there. I have a couple of things I need to tackle now, like cooking a whole turkey. I usually procrastinate on things like that because it means you just have to deal with all the meat that's left. It's a commitment. Our family is in the middle of saving up for some fun that's to come later in the year, so that was part of the motivation to take on this pantry challenge. I've been hoping to get everyone involved in making the choice to save money as opposed to spending it in some tangible ways. One way we're doing this is by having an actual cash saving jar. It's hidden away, and I created this tracking page where we can mark off each $50 that we add to the jar. 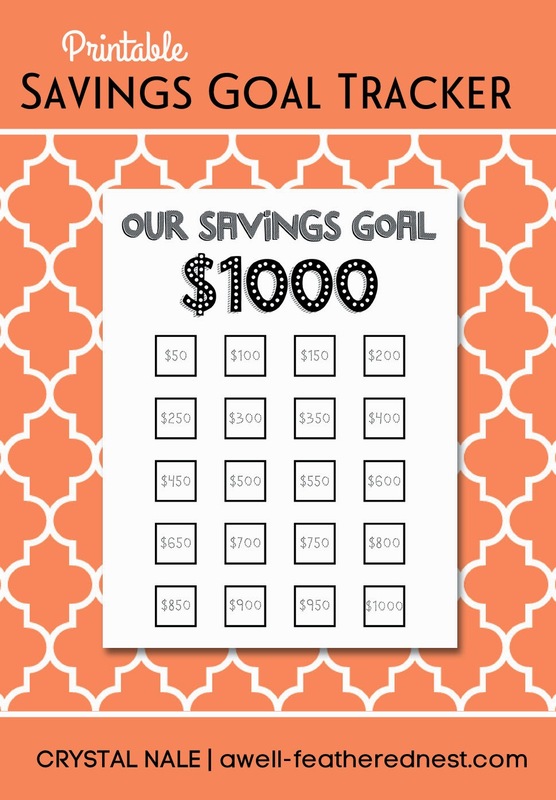 If we can color in all the squares by the end of the year, then we will have saved an extra $1000! This serves, not only to get our kids involved, but to keep it in the front of my mind on a daily basis. My husband and I have a little competitive streak, so having a visual record of our progress really keeps us on track. I was able to save $200 from our cash grocery budget just by focusing on using what was already hanging out in our pantry and putting in a little extra effort. If you think you'd like to get motivated to save a little cash, I'm sharing this PDF of the $1000 savings tracker with you all today. Print it out, slap it on the fridge, and get motivated to save some pennies...and dollars.